This week on Spotlight Series, allow me to introduce some knives that basically need no introduction: the new Benchmade Griptilian models. The Griptilians are one of Benchmade’s best loved knives, and this latest iteration admirably carries that torch. While you may feel like you know the Griptilian backwards and forwards by this point, Benchmade has thrown in some nice new features to make these ones worth the upgrade. Chief among these is the first-ever use of G10 handles in a production Griptilian. These are predominantly smooth to the touch, with a patch of pronounced diamond texture to enhance grip. The classic handle shape and size are maintained, so handling is as comfortable as you expect from this model, with ample jimping on the spine to allow for extra purchase. The G10 is a matte gray with really stylish blue accents, which pair perfectly with the blue barrel spacers for an attractive overall appearance. The drop point blade is available in two finishes, a satin or a matte black. The black is my personal favorite for the way it contrasts with the lighter grey handle. 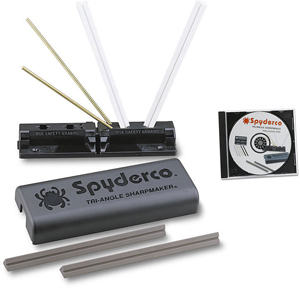 You can get both finishes in a plain blade or with partial serrations. Blade is deployed via the ambidextrous thumb studs, with an ultra smooth, easy action. An alternate method is to depress the Benchmade-patented AXIS lock and give a flick of the wrist to send the blade snapping out. 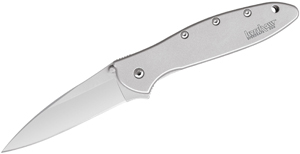 The blade steel also gets an upgrade this time around, with a CPM-20CV stainless steel construction. The blade is held securely in place by the AXIS lock, which is totally ambidextrous. The deep-carry pocket clip is reversible, allowing for left or right side, tip-up carry. On the whole this knife is very friendly for left hand users in a way you don’t often see with production models. This week on Warehouse Hunts we’re taking a look at the new Dragon line of kitchen knives from Yaxell. Yaxell has been one of the leading knife manufacturers since 1932, and they’ve carefully handcrafted the Dragon series in Seki-City Japan. These nine knives are all sold separately so you can build your kitchen set however you see fit. The real main-stays you’re going to want are of course the paring knife, utility knife, and chef’s knife. The paring knife in this line has a 3.5′ blade, useful for peeling, trimming, and other finer tasks where you need a lot of control. The Chef’s knife is available in two sizes, an eight inch or a ten inch. These are going to be your real workhorse kitchen knives, perfect for larger cutting tasks, and the curved shape of the blade lets you rock the knife to make for really easy chopping. The utility knife hits that Goldilocks sweet spot, handling jobs that are a little too big for the paring knife, but too small for the full might of the chef’s knife. Besides the must-haves, the Dragon line has five other, more exotic blade shapes for those of you who get serious with your cooking. There’s a 6.5′ Panini knife and a 9′ bread knife, which both sport scallop serrations, and the Panini knife has a nice rounded tip making it perfect for spreading condiments. There’s also an 8.5′ Nakiri for chopping herbs and vegetables, a seven and a half inch santoku, and a 9′ slicing knife. This whole line is drop-forged, using BD1N stainless steel, which has a Rockwell hardness of 63 for really terrific edge retention. There’s a very attractive satin finish to the blade, which is nicely offset by the polished black micarta handles. 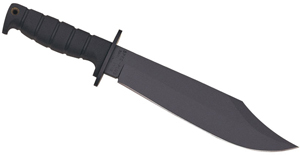 The FDA-approved micarta is extremely heat-resistant, and non-shrink to maintain that seamless hygienic fit and finish, with a sturdy triple-rivet construction. The straight back and curved belly of the handle enable a really comfortable, confident hold.